In 2015 more than 45000 unaccompanied minors sought asylum in the Nordic countries. This map shows their distribution across the Nordic municipalities and regions based on the number of unaccompanied minors per 1000 inhabitants. This measure is useful for highlighting municipalities and regions where the number of unaccompanied minors is largest in relation to the size of the population as a whole. Municipalities with the highest number of unaccompanied minors per 1000 inhabitants are generally those which are rural in character, have small populations and host Refugee Accommodation Centres. For example, Hyllerstad, Ibestad and Vestre Slidre (Norway); Sorsele, Åsele and Bjurholm (Sweden), Ærø (Danmark) and Pertunmaa (Finland), all have more than ten unaccompanied minors per 1000 inhabitants. The highest number of unaccompanied minors per 1000 inhabitants is found in Hyllerstand in Norway (31.4). 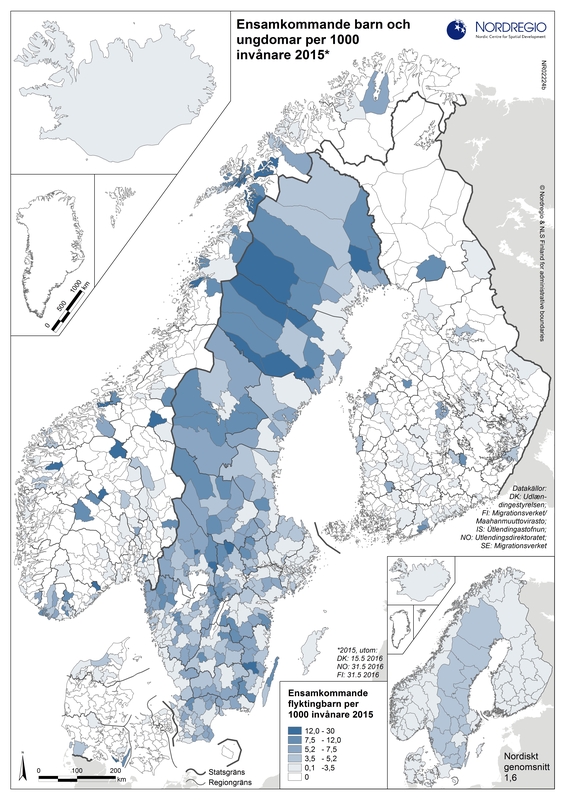 In the bigger cities, unaccompanied minors make up a much smaller portion of the population with the highest numbers found in Gothenburg (3.1) Stockholm (2.4), Malmö (1.7) and Espoo and Oulu (both 0.9). The bigger cities in Norway and Denmark had less than 0.2 unaccompanied minors per 1000 inhabitants. In Sweden, unaccompanied minors are more evenly distributed than in the other countries. This is largely due to an agreement on receiving unaccompanied minors signed by all Swedish municipalities. In Norway, Denmark and Finland unaccompanied minors are instead directed to accommodation centres located in certain municipalities. Reference dates for data: Sweden (everyone directed to a municipality during 2015); Norway and Finland (situation on March 31, 2016); and Denmark (situation on March 15, 2016).